I’ve been working with PHPUnit a lot, probably since 2007. Unit testing and automatic testing in general is important, and it becomes even more important when it comes to team play. Unfortunately, in different teams that I have worked in, I often observed a situation when tests don’t receive all the attention they deserve, sometimes way too little attention. In this article I’m gonna cover certain things that you should avoid in your tests, the mistakes that are still often made even by experienced developers. 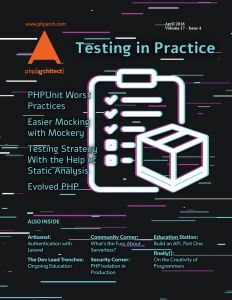 Mockery tries to provide an easy to read and understand API, which is also versatile enough, so any scenario that might come up when working with mock objects in our test cases are covered. In this first part, we’ll see how Mockery can be used to create different test doubles and how they fit into a test suite. Authentication is the foundation of your application’s security. Authentication separates guests from users and restricts functionality in your application to authenticated users. We can also take authentication a step further and completely offload the grunt work to some other service such a GitHub, Google, or any other third party authentication service provider. As a development lead, one of the best things you can do for your team is encouraging and fostering an environment of ongoing learning. There is an entire world of developers out there who stagnate in their jobs because they don’t learn anything new. It does not have to be a whole new language, but every developer should be learning constantly. There are a few ways you can help with this. In this series, we look at using Behavior-Driven Development (BDD) and specification by example to develop a RESTful API with JSON-formatted request and response. In Part One we introduce these concepts, design our database, and implement a minimal working API. Community Corner: What’s the Fuss About Serverless? The new kid on the block is this “serverless” technology. But what’s the fuss about? This new concept seems intriguing if only for the name, and has perhaps even garnered skepticism because of the name. I’m sure you’ve heard the joke “there is no cloud, it’s just someone else’s computer” before, but serverless appears to take this one step further by eliminating the server altogether. Jokes aside, there are, of course, servers somewhere in the stack, but the goal of serverless computing is to take the concern of servers out of the mix when developing applications. This frees developers up to think about the application side of things and worry less about the platform on which the code runs. Last time, we looked at how to go about adding our own syntax to PHP. We explored a range of options; from submitting to the core project, to using preprocessor macros. We looked at a few uses for custom syntax and even created a silly little Minecraft DSL compiler.